Adding professionally designed landscaping can turn an ordinary suburban property into an extraordinary gem. When done correctly, landscaping can complete a look, increase home value, and dramatically transform an average backyard into a spectacular hideaway. 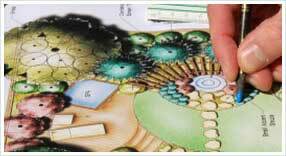 Investing in a professionally prepared landscape design ensures customer satisfaction and guarantees years of enjoyment. With assistance from professional landscape designers, simple changes to plantings and hardscape features can boost curb appeal and capture that unmistakable wow factor. One of the keys for selling homes in a buyer’s market is increasing curb appeal by installing and maintaining above average landscaping. Simple upgrades that elevate existing landscaping from average to above average can increase home value by 15%. According to industry statistics, 99% of realtors see landscaping is a universal selling point that increases a home’s appeal for prospective buyers. Investing in landscaping before selling a home can result in a faster selling time and a higher sale price compared to homes with minimal or average landscaping. By working with trained professionals, you can benefit from years of industry experience and avoid costly mistakes and pitfalls homeowners face while completing landscape projects on their own. Green Acres designers will work with you to select locally adapted plants that are proven to thrive in diverse climatic conditions. Designers can create low-maintenance, drought tolerant, and xeric landscape designs to suit any budget and style. Landscape plans can include integrated patios, walkways, retaining walls, and other hardscape features that add to property value and increase usable outdoor space. Plantings can be designed to compliment existing features, such as courtyards, patios, swimming pools and other outdoor focal points. Raised beds, berms, and living privacy screens add dimension and texture while creating a secluded environment in a suburban or urban environment. Even if you’ve never owned a yard before, Green Acres can work with you to identify your needs, select appropriate plants, and answer any questions you might have about care and maintenance. Professionally designed landscapes can include an enormous variety of walkways and hardscape features that enhance the natural look of your home and property. Depending on your budget and needs, you landscape design may also include integrated low-voltage landscape lighting to bring out the best features of your home and landscape while increasing property security. Working with landscape designers and the professional installation team at Green Acres will give you the superior results you need to sell your property quickly in a competitive real estate market and increase home value by 15%. With a professionally prepared landscape design, homeowners can double their landscape investment in increased home value at the time of sale. Landscape improvements are one of the most effective improvements homeowners can make; bathroom renovations and kitchen makeovers are costly with homeowners recovering only 50% to 75% of the original installation cost. On the other hand, a professionally designed landscape can yield a 150% to 200% return on investment. With a $10,000 landscape budget, a homeowner in a $200,000 home can gain a 200% return on their investment by selling the home for the increased price of $220,000. Patios, outdoor living rooms, and other permanent landscape features increase marketability and make your backyard a great place to hang-out with family and friends.